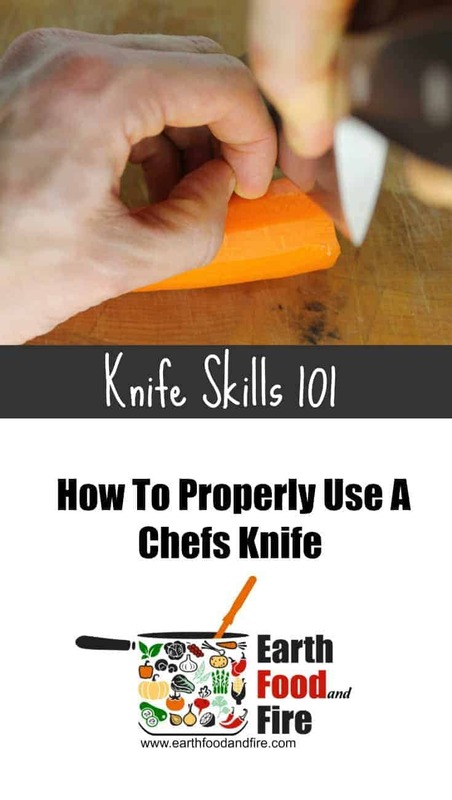 Knife skills are an important part of becoming a good cook. Knowing how to use a knife properly allows for a safer work environment, (either at home or in the industry), more efficient(faster) cooking and prettier looking recipes. If you are able to quickly and uniformly cut vegetables and other food items, the dishes you create will have a cleaner more professional look and, the cooking itself will go faster as less time is spent prepping. 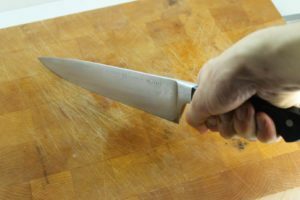 Besides knowing how to sharpen your own knives and choosing the proper knife for the task at hand, there are some basic knife cuts and skills everyone should have. Grabbing the knife right at the hilt where the blade and handle meet. This creates a more stable grip, allowing faster and smoother cuts to be directed through the wrist. Think of the blade as an extension of your arm. 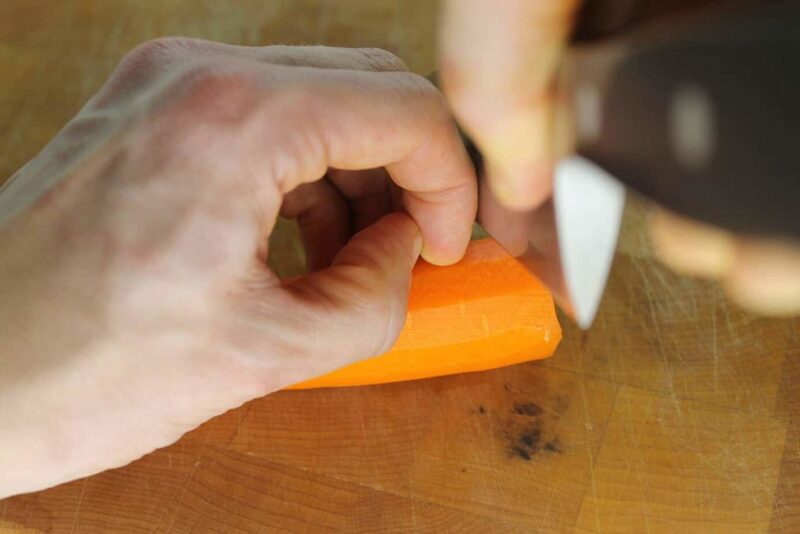 The next knife skill that is just as important to learn, is what to do with your non-knife wielding hand. The hand that is used to hold whatever it is you are cutting. Again you can simply hold on to the food item with that hand but there are tips and tricks that will reduce the chance of you cutting your fingertips and allowing you to cut faster, and more confidently. Ever wonder how chefs can cut so fast and not hurt themselves? The key, (as shown below) is that you curl in your fingertips. This allows the knife blade to slide up and down against your knuckles without ever having to fear for your fingertips. If you hold your hand like shown your fingers should never be under the cutting edge. Remember to curl in your thumb as well! Besides lots of practice and experience, this is the secret! 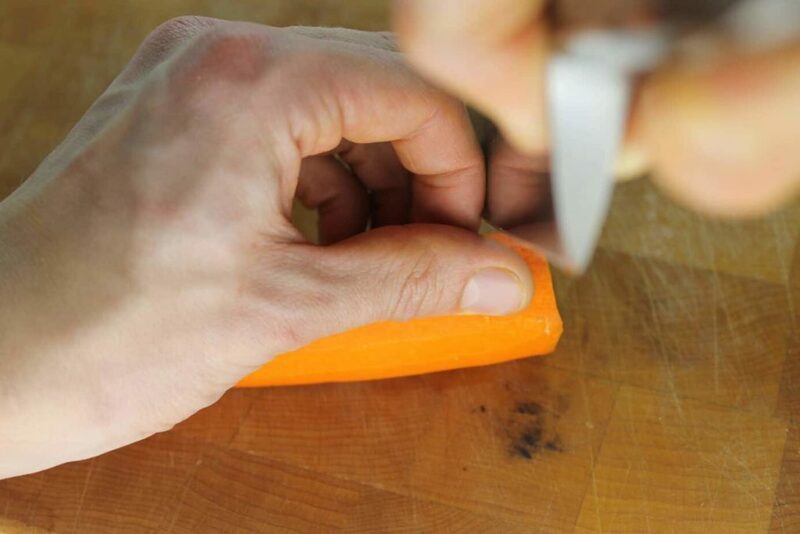 Learn the tips and tricks chefs use to avoid cutting their hands, and making evenly sized cuts! Once you know the basics of how to properly hold a knife, there are also a few basic cuts that are important to know. 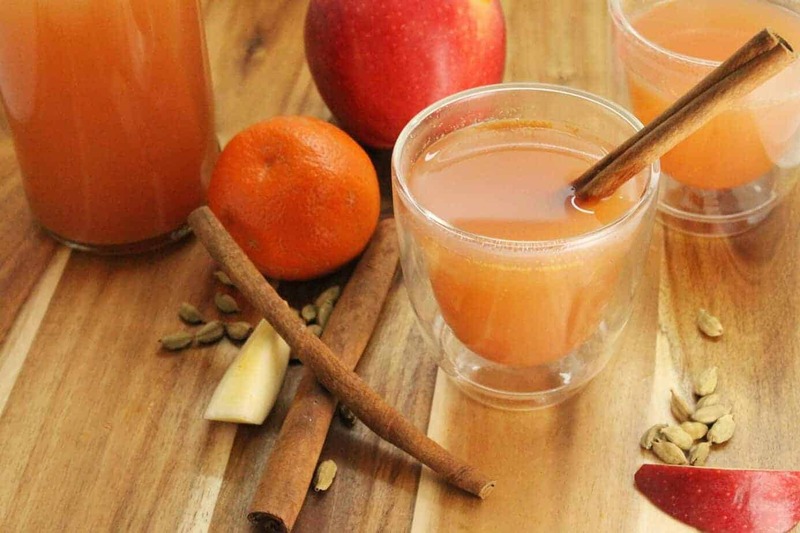 You will often see these referenced in recipes and by cooks when talking about cooking. Terms such as, small, medium, and large dice, julienne, and allumette, are all specific cuts. 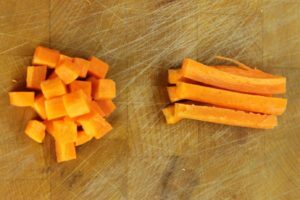 Ithat if you say to another cook, “I need these carrots medium diced, and the onions julienne”, regardless of who does the cutting the end product should be the same or at least very similar in size. 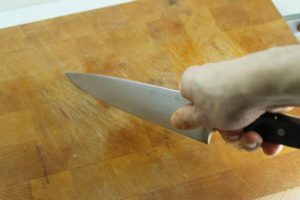 These cuts are all part of the knife skills that cooks will learn in the industry or at school, so I recommend practising these if you want to become a better cook. Cutting vegetables, brunoise, small dice, medium dice, and large dice, is easiest if you first cut the vegetables into sticks. These sticks conveniently correspond with a certain sized dice cut. 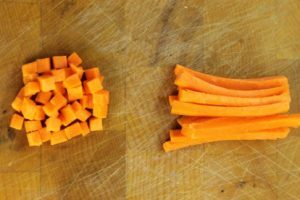 So for example, if you cut a carrot into julienne sized strips and then cut these strips horizontally into small cubes, the end result is a brunoise cut. The same goes for allumette and small dice, batonnet, and medium dice, and baton and large dice. 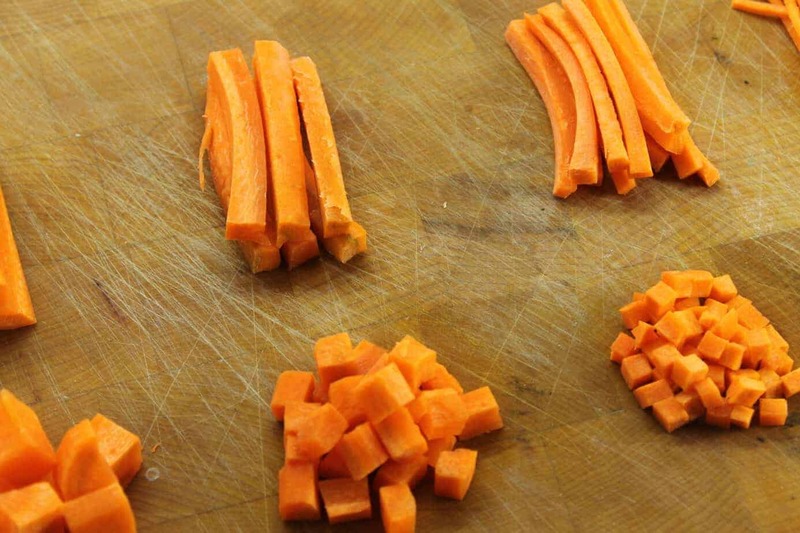 When cutting all of these shapes it is easiest to start by squaring up the vegetable into a rectangular shape, that you can then cut into slices and then into sticks and cubes. cutting vegetables into 1-2mm x 1-2mm x 4mm sized pieces. Brunoise is the smallest of the diced vegetables with a rough dimension of 2mm x 2mm x 2cm or slightly smaller. These small cubes are generally used in garnishing soups or very fine chopped fillings. A brunoise cut is accomplished by first cutting the vegetable into a julienne size and then cutting horizontally along its length. Allumette (French for matchstick) is a slightly larger sized stick with a size of 3mm x 3mm x 6cm. A Small Dice is the next step up from a brunoise with a cube size of 3mm x3mm x 3mm. 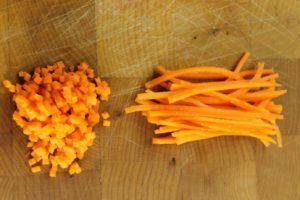 A small diced cut can be accomplished by first cutting your vegetables into allumette sized sticks and then cutting horizontally along its length. Battonet is roughly double the size of an allumette with a size of 6mm x 6mm x 6cm. 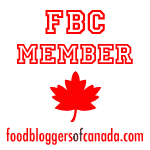 This is the size most commonly used for crudites or other vegetable finger foods. Medium Diced vegetables have a size of 6mm x 6mm x 6mm and is the most commonly used dice or size in recipes in my experience. 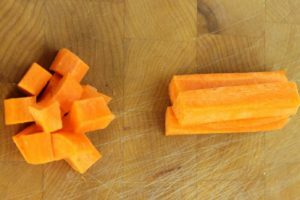 This is mainly due to the fact that a medium dice is the perfect bite size piece.A medium diced cut can be accomplished by first cutting your vegetables into battonet sized sticks and then cutting horizontally along their length. Baton is the largest of sticks and is most commonly used when presenting vegetables in an attractive fashion. A good example are thick cut fries. Baton cut vegetables have a size of 12mm x 12mm x 6cm. Large Dice is most often used as the standard size when cutting Mirepoix and is about 12mm x 12mm x 12mm in size. A large dice can be accomplished by first cutting your vegetables into baton sized sticks and then cutting horizontally along its length. 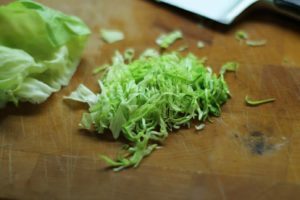 A Chiffonade is referred to when cutting leafy vegetables or herbs by stacking the leaves, rolling them up and then thinly slicing them. This is most commonly used as a garnish. 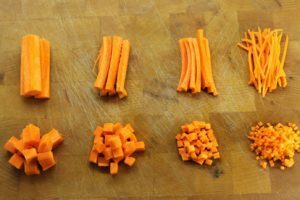 All of these basic cuts are used on a regular basis in a professional kitchen and in order to further your knife skills and become a better cook it is a good idea to learn how to properly cut these. The dimensions I referenced are the “standard” size as is taught in most Culinary Schools, and in the On Cooking textbook. 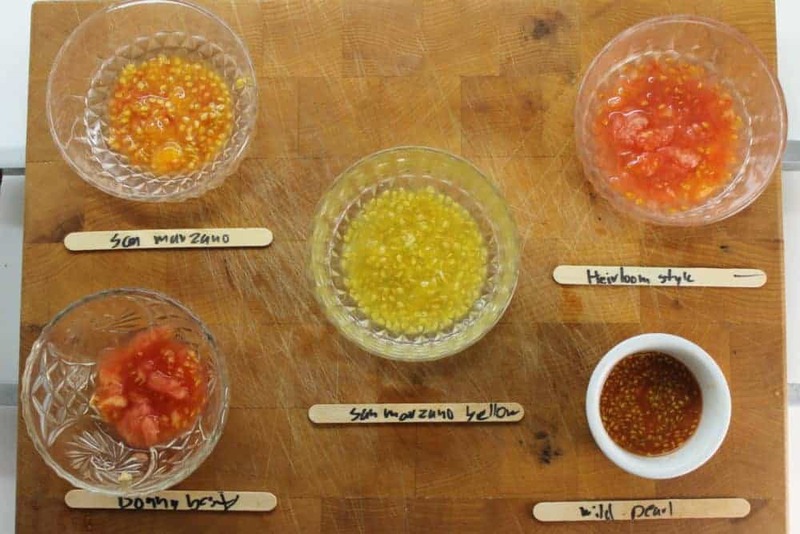 These exact sizes may vary slightly by chef, but are generally all in the same ballpark. I’ll be doing another post soon showing how to cut other vegetables, like onions, tomatoes and mushrooms most efficiently, so make sure to check back for the weekly blog post! Great post, Markus! I learned a few things and am going to bookmark this for future reference. Have a great weekend and thanks for sharing your knowledge with us! What a great post. Sometimes I wonder how those chefs get those exact little pieces so neat, tidy and identical….now I know…thanks!! Great breakdown of basic cutting techniques and a good refresher. Practicing and developing these skills are the foundation any kitchen master or mistress. The wonderful thing about cooking is that there is never a need not to learn more. Brings me back to culinary school, didn’t remember the allumette one though 😉 I agree with you, a good cook, need to know how to handle his knife. Thanks for sharing!